Hop aboard this old-fashioned train and embark on a scenic journey through northern New Hampshire's Mt. Washington Valley. 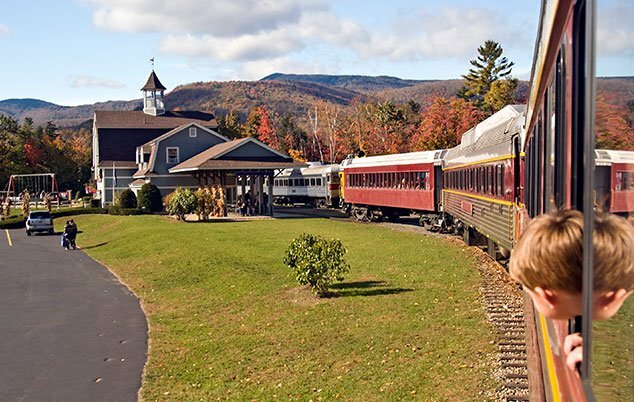 Departing from a beautiful 1874 Victorian Station in North Conway Village, enjoy rides to Conway or Bartlett or the legendary Crawford Notch excursion. Experience the fun of rail travel in the comforts of an open or enclosed restored vintage cars (from the 1920's), and travel in Coach, First Class, or in the elegant Dining Car. Ride past sheer bluffs, cliffs, steep ravines, cascading brooks and streams, panoramic mountain vistas, and bridges on the Conway Railroad. Check out the Grand Summit Hotel's special package for the Thomas the Train events in July. Valley Trains run April 15 through December 31. The Notch Train operates June 13 through October 28. Train times vary but usually run from 10 am to 6 pm. Yes, you may bring food when traveling in Coach, but not in First Class. If you wish to have a picnic before or after your Valley train ride, tables are available outside the North Conway station, and at Crawford Station for Notch Train passengers. The onboard snack bar offers sandwiches, snacks, and beverages for purchase, while boxed-lunches are available if pre-ordered with your reservation. Enhance your ride with a meal on board. There are dining cars available on the train Hattie Evans on Notch Excursions, Chocorua on Conway and Bartlett excursions. How long is a ride on the Conway Scenic Railroad? Typically, all train rides run anywhere between 1.5 hours for Valley rides, to 5.5 hours for Notch train rides, depending on where you are headed and the excursions you make. The Valley train rides are 11 and 21 miles round-trip, while the Notch rides are 50-60 miles round-trip. With scenic stops along the way, enjoy this historic train ride from start to finish.